Scholars to star in Gulbenkian Theatre lunchtime concert | Music Matters | Because it does. Doesn't it ? 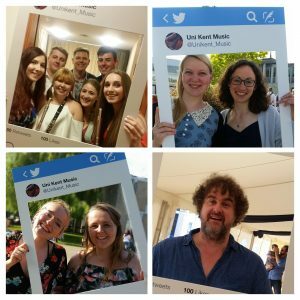 As part of Summer Music this term, several of the University’s Music Scholars will be starring in a lunchtime concert on Wednesday 6 June at 1.10pm. Flautist with the University Orchestra and second-year Historian, Kathryn Redgers, will perform Bach’s Flute Sonata in G minor BWV 1020 accompanied by yours truly on the harpsichord. Second-year soprano Marina Ivanova will sing Vivaldi’s sublime cantata, Nulla in mundo pax sincera, accompanied by the University Camerata. Marina is a member of the University Chamber Choir and Chorus, and both Marina and Kathryn have previously performed in the Scholars’ Recital as part of the Canterbury Festival each year in October. In her spare time, Marina reads Economics and Spanish! Making their solo performing debuts at the concert will be first-year harpist, Emma Murton, and first-year percussionist, Carina Evans on marimba, in solo instrumental works.